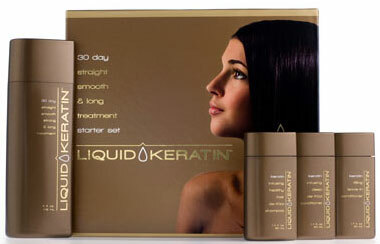 Liquid Keratin is a new keratin treatment for frizzy, unmanageable hair that can be used at home. You spray it in and wait 30 minutes for the keratin protein to penetrate the hair. Liquid Keratin doesn’t have the strong straightening properties of Brazilian Keratin Treatment, formaldehyde, or similar chemicals. It will not make hair 100% straight but it’s an effective anti-frizz product for natural curly, hard-to-control hair. It also adds strength and thickness to hair, making it appear healthier. The product contains hydrolyzed keratin extracted from New Zealand wool. The molecular weight of hydrolyzed keratin is much smaller than other types of keratin proteins. So it will not only coat the surface of the hair for protection and strength, but will penetrate into the hair shaft and act as a deep conditioner. Theoretically the product can also be used as a repair therapy for damaged hair that needs reconstruction of the hair cuticle. One of the downsides of Liquid Keratin is that it won't last as long as a salon treatment. The effects of Liquid Keratin last up to 6 weeks compared to several months with salon treatments, so you will need to reapply it more often. The starter kit (only available in US) costs around $70 USD and is enough for 30 days of treatment for medium-length hair. Another problem is that it can't be used with regular shampoos and conditioners that contain sodium chloride. The company recommend that it has to be used with its own shampoo and conditioner to ensure lasting results. According to the manufacturer, the answer is yes to all the above. But for those with blonde, highlighted, or bleached hair, I suggest you do a hair strand test before using Liquid Keratin. That’s because the hydrolyzed keratin has a yellow-brown color and could cause noticeable discoloration of blond hair color. Purified water, dimethicone, dimethiconol, sodium cocoyl aminoacids, biformyl, potassium dimethicone PEG-7 panthenyl phosphate, hydrolyzed keratin, sodium laneth-40 maleate / styrene sulfonate copolymer, phenoxyethanol, ethylhexylglycerin, laureth 4, laureth-23. Is it 100% formaldehyde Free? Yes and No. The product is 100% formaldehyde free but it contains Biformyl, which is formaldehyde derivative with synonym name Glyoxal or Oxalaldehyde (C2H2O2).